Create an interactive content grid. The Grid View component creates an interactive content grid. You configure the component by specifying content within a table, and by configuring its look-and-feel and level of interactivity. You specify content by editing a table in the Rich Text Editor. By default, the component includes a 3-by-4 content grid. 2. Edit the default content. Click within the cells to edit the default content, or use the right-click menu to edit the table properties. You can also edit the code directly by using the HTML Source Editor. Note that the first row is defined as the table header and must not be deleted. The default grid content and the right-click menu are shown below. Column Move Select Yes to allow columns to be moved. You move a column by selecting its header and dragging it to a new location in the grid. 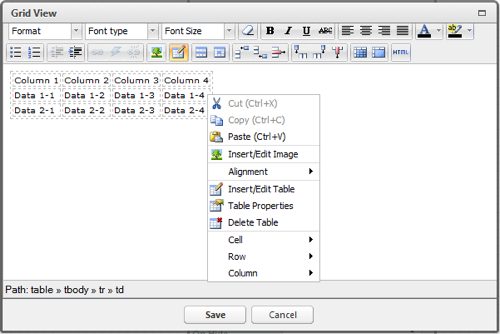 Column Resize Select Yes to allow columns to be resized. You resize a column by selecting the vertical divider in the header and dragging to the left or right. Column Sort Select Yes to allow column content to be sorted. You sort a column by clicking its header. Column Hide Select Yes to allow columns to be hidden. This feature is available via a context menu, which you can display by clicking the menu control in the header. ForceFit Select Yes to auto-size the columns to fit within the component borders. Select No to prevent columns from auto-sizing.